I must say, I love heels. They kill my poor little feet, but I forgive them every time. The truth is that they are just too cute not to wear. These first heels are Steve Madden, one of my favorite shoe designers. These gold glitter shoes are whimsical and elegant at the same time, one of the shoes more endearing qualities. You can find these shoes at Beta.com. I love these silver shoes! The rhinestone bow is soo cute!! 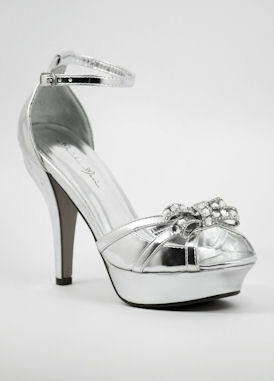 You can find these shoes at ShopZoey.com. These shoes are going for 34.99. I love these Steve Madden black ruffle shoes! The open toe is so cute, and I just love the ruffles!! You can find these shoes at Eshoespot.com! ~ by thegirlwithadream on February 22, 2011. Holy crap. I’m in love with these shoes. The sparkly ones are my favorite. And I’ve been lusting after them for months now! i loveeee heels too! they are amazing i must say. i cant wait till im older and i can wear them all the time! I love these shoes, they’re so cute yet classy!